Browse > Home / Archery / Archery for All! 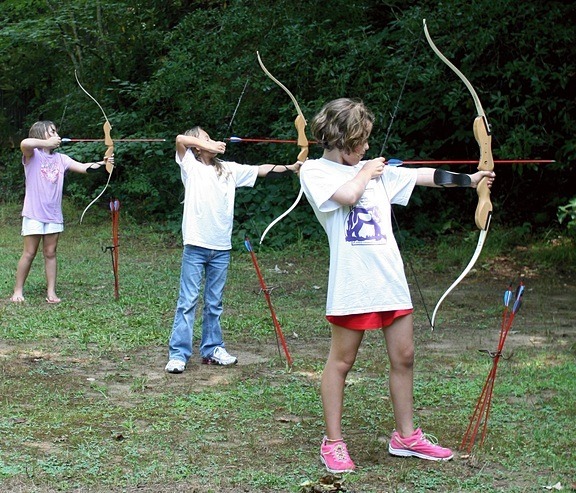 Among the outdoor games children play at camp, archery is popular with all aged children. No matter what their level of experience, girls can enjoy shooting a bow and arrow. Some of this comes from adjusting how far away the targets are (and therefore making it more challenging for older children to get a bullseye), but also the sport of archery itself is an outdoor game that takes a lot of practice. It’s very difficult to be consistent in your shooting, so it’s always possible to improve your shot. From the youngest juniors, who are as young as 6, through the oldest seniors, who are 15, everyone enjoys the outdoor game of archery at camp. 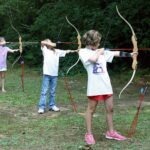 4 Responses to "Archery for All!" My girlfriend likes to be an archer and she is great both in Archery and Volleyball. when i was a kid i idolized robin hood that is why i love archery today. it is actually hard to master archery, it took me 2 long years to be a master of archery!